Wash the asparagus, remove the woody stem and tips. Keep the tips whole and then cut the green stem into thin slices. Wash the baby spinach leaves. Heat a frying pan and add the olive oil. Add the asparagus to the pan. Once the asparagus begins to colour, add the chicken stock, butter, garlic, thyme, bay leaf and salt. Cover and cook over a high heat until the stock has reduced and emulsified with the butter. Remove the lid and remove the pan from the heat. Add the spinach leaves and season with pepper. Bring a large pan of water to a rapid boil. Add the eggs to the pan and cook for 4 and a half minutes. Remove from the pan and plunge into iced water to cool. Once cool, remove the shells. Heat a saucepan and add the pine nuts. Toasts until golden brown. Cut the olives into quarters and then add to the pine nuts. Cut the ham lengthways into 3 slices and then cut across the width of each slice to form strips of ham. Add the ham to the olives and pine nuts. Pick and finely chop the basil leaves and add to the mixture. Finish with the olive oil and vinegar and combine gently. Finely grate the parmesan. Sprinkle the parmesan on to a silicone baking sheet, forming individual circles of cheese. Transfer to the oven and cook for 4 to 5 minutes or until golden brown. Take care not to overcook the parmesan. Plate the asparagus and spinach salad, making sure the tips are visible. 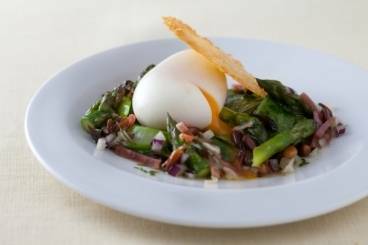 Place a soft boiled egg in the centre and then add the pine nuts, olive and ham dressing. Finish with a parmesan tuile to serve.